We talked about Choose Your Own Adventure books several times on Retroist.com (here, here, here, and here). But I have to talk about them again just a little because I finally purchased one. I was happy to find that Choose Your Own Adventure books are on the Kindle (along with Fighting Fantasy books), but I haven’t yet purchased one because they didn’t have any of the ones I remembered. Most notably, they didn’t have The Cave of Time. If you’ve read this, you know that I didn’t get to read The Cave of Time when I was in grade school because a schoolmate lost the school’s copy. After waiting too long to see if it would come on the Kindle, I finally purchased a hard copy. And once I got this hard copy, I realized one of the many things that kept me coming back to the Choose Your Own Adventure books. It was the covers! Look at the cover for The Cave of Time. A creepy knight-like guy. A samurai. A T-Rex under a moon. Me on a horse heading for a castle. And the Loch Ness Monster. Not only were all those things cool, but the suggestion was I’d get to meet them all! And that’s what I wanted to do, and when I didn’t meet them all on my first adventure, I went back and made new choices in an attempt to do so. It was that promise of meeting all these cool people and monsters that kept me going through these books time and time again. Oh no! Never choose page 75! And that, my friends, is the secret of the Choose Your Own Adventure books. I was a huge CYOA fan, as well as the other similar books like the escape from… series, the time machine series, the which way series, the pick-a-path series, the D&D endless quest series, the lonewolf/world of lonewolf series, the wizards warriors & you series, etc, etc, etc. I still have all the copies I ever had of those assorted books (except for a CYOA jr (or whatever the exact name of the series was) one that got lost years & years ago). I have about 30 CYOA books, 16 or 18 of the D&D ones, about 8 lonewolf ones, and probably 15~20 assorted other ones. Did you know that the lonewolf ones are now available online for free (legally)? You can either play them in your browser or download them & play them offline. The site is called project aon. Fighting fantasy ones are similarly available, at ffproject.com. One of the nice things about that is that any kindle with web access can play these for free. Great post, Doug! One of my favorites and I believe there were only one or two of them published were the Star Trek ‘Which Way’ books. I only had the first one entitled Voyage To Adventure. You were an Ensign that was serving on the Enterprise and you were able to choose a career path, Science with Mr. Spock, Command with Kirk, and the one I chose first, Engineering with Mr. Scott. I still have one of those trek ones, “phaser fight”. I also have a couple nintendo/mario ones, and a CYOA “super adventure” one. I bought about 10 CYOA books for my Montessori classroom 2 years ago. The stories include, Day with the Dinosaurs, Atlantis, My very own robot, Dinosaur Island, Mountain Survival, just to name a few. They were an average of $1.50 each on Amazon, and what a value! I have 26 kids from 3-6 years old who are enthralled with the power to choose and explore these books. I would absolutely recommend buying the CYOA books off Amazon while they are still available. My all time favorite is Dinosaur Island! I’ve recently acquired the first 60 or so books for my collection – all printings from the 80’s when I was reading them. I stopped at 60 because I didn’t recognize the other 40 or so titles which must have been published after I grew out of them. I’ve also acquired a number of the “Which Way” books, “Twistaplot”, and other similar series that followed. For some reason “The Mystery of Chimney Rock” always stuck out as the most memorable one for me from the original CYOA series. @Anthony – first 60? You know what they call a guy like you? Awesome. I agree about Chimney Rock. It is one of the more memorable ones as well. I have 48 actual CYOA books. I have the first 22 in order, then I have a handful of 30s, a handful of 40s, etc. The highest numbered one I have is 98. All are from the original run, with #98 having been published in 1990. What I really want is a full set of the wizards, warriors, and you series. I also want the endless quest ones by TSR. Equally awesome, Drahken. I just have The Cave of Time. I guess it is representative enough for my nostalgia needs. I might pick up chimney rock, though, as well. Love these books, as they were like cool (if briefer) text adventure games without the parser headaches. I seemingly read hundreds of these things in my formative years. My friends lent and traded them constantly in a bustling schoolyard black market. Doug – great post and a great book. The covers were often the deciding factor for me in selecting which Choose Your Own Adventure to try. 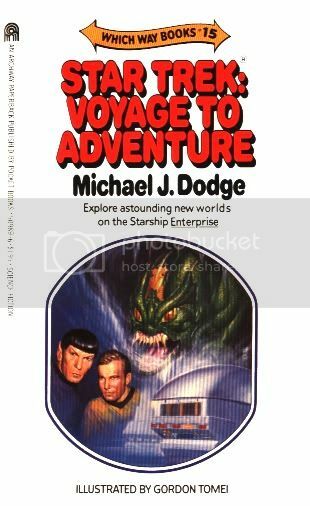 @Vicsage – I had no idea there were Star Trek versions. I’ve gotta find one of those! @vinvectrex: There’s an insane number of these types of books, checkout gamebooks.org for a comprehensive list. Previous post Lazer Tag Academy. The Full Moon Review.